In Standard Reports, in the Monthly section, click Finance Charges. 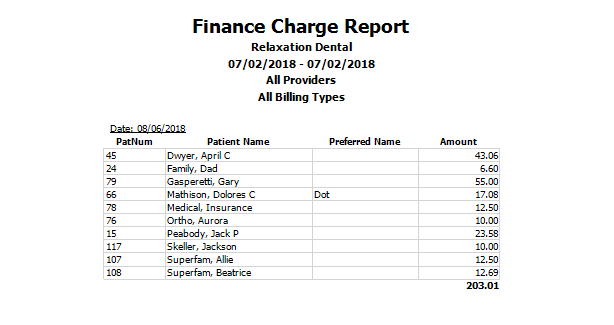 This report lists all Finance Charges applied on a selected date. Note: To control user access to this report, see Report Setup: Security Permissions. Providers: Highlight the providers to include in the report, or check All to select all providers. 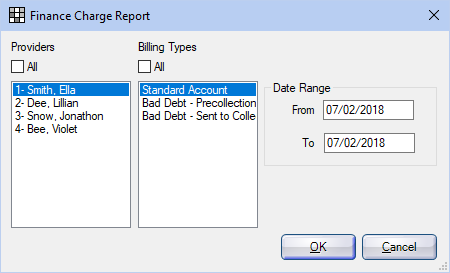 Billing Types: Highlight the billing types to include in the report, or check All to select all billing types. Date Range: Enter the From and To dates. The date range defaults to the last day the finance charge tool was run. Also see Complex Report System.